Shanghai - Vladivostok Liner Service was launched in September 2010. Then, on the later of the line operation, SASCO vessels commenced to call on Vostochny port to discharge. From September 2011 SASCO has been offering additional vessel call on Ningbo. This step forward we made to pursue better service and faster delivery of your cargoes to the ports of Russian Far East. Now we offer vessels to depart from Shanghai and Ningbo and call to discharge on Vladivostok and Vostochny ports on weekly basis. The container handling terminal in Shanghai is WGQ-4, in Ningbo - MSCT, in Vladivostok - VSCT, in Vostochny - VSK. Container stock owned by SASCO is available in Shanghai, Ningbo, Qingdao and Vladivostok. In July 2011 Vladivostok Sea Fishing Port detached the birth in VMKT for handling of SASCO liner vessels operated on domestic lines. This helped to remedy the situation in Fishing Port which became more and more congested due to domestic vessels were handled alongside with import and export bound vessels. That provided more dispatch of handling of SASCO vessels operated on Shanghai - Ningbo - Vladivostok - Vostohny Liner Service. Shanghai is the largest Chinese port and one of the largest world ports. It lies in the estuary of Yangtze river. Shanghai is direct-controlled municipality, important national financial and cultural center as well as the largest world sea port. Ningbo is one of the most important and Chinese busiest ports by cargo tonnage. It is at the crossroad of the north-west shipping route and the important waterway of the Yangtze River. Ningbo is modern multipurpose deep sea terminal, which comprises inland, river and sea births. Vostochny port is a major port in Russian Far East. It is situated on the coast of Sea of Japan, in the Bay of Vrangell in Primorsky kray, 20 kilometers away from Nakhodka town, which is the terminal point of Trans Siberian Railway. 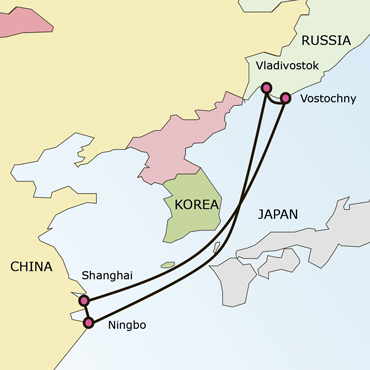 Shanghai - Vladivostok line is connected with SASCO domestic service to Korsakov, Magadan, Petropavlovsk-Kamchatskiy ports as well as with railway service to main national terminals. Liner tariffs for directions Vladivostok/Vostochny. Liner tariffs for directions Korsakov/Magadan. For any questions please contact our staff. Oriental Shipping Agency Co., Ltd.
All customers are invited to use our service.